Effective coverage – the fraction of health gain actually delivered by the health system to the population in need – is emerging as a critical indicator of progress towards universal health coverage. Estimates of effective coverage can be calculated based on the population in need, utilization of health services, and quality of the care delivered. Limited research has addressed effective coverage of care for children under five. In this ongoing work, we have assembled direct observations of clinical care conducted in the Service Provision Assessment surveys in 8 countries, covering a total of nearly 20,000 children, and defined quality as adherence to the 2014 guidelines on Integrated Management of Childhood Illness (IMCI), in other words appropriate assessment of disease history, physical exam, testing, and counseling and management of disease. We linked these data at the sub-national level (e.g., province) to household surveys that include parental report of children’s recent illness–diarrhea, fever, or acute respiratory infection–and subsequent care seeking. Many countries demonstrated considerable gaps in coverage, with as few as 40% of parents taking children to formal health care providers in Haiti, Rwanda, and Senegal. Adherence to IMCI guidelines was low, ranging from 29% in Haiti and Senegal to 53% in Namibia. 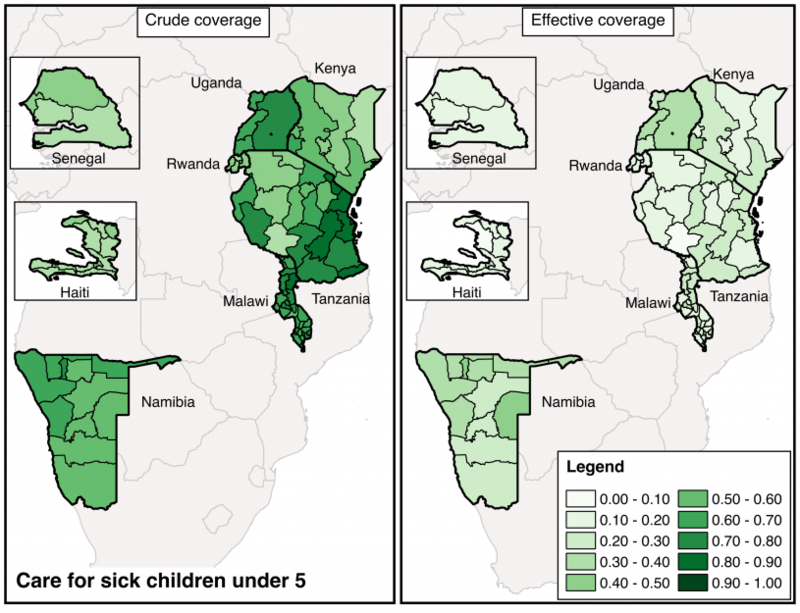 The impact of poor quality on coverage estimates is evident in the map, where even regions that have successfully linked children to necessary health care demonstrate major gaps in effective coverage. As it stands, children brought to care receive less than half of essential clinical actions expected by international standards. Attention to this quality deficit is necessary to ensure that health care services actually improve population health. Next PostNext What % of Haiti’s population has access to good quality primary care?